Teachers this is an opportunity to provide your students with a unique educational experience! Through the use of primary source documents students will become familiar with six families who actually experienced life on the Oregon-California Trail. 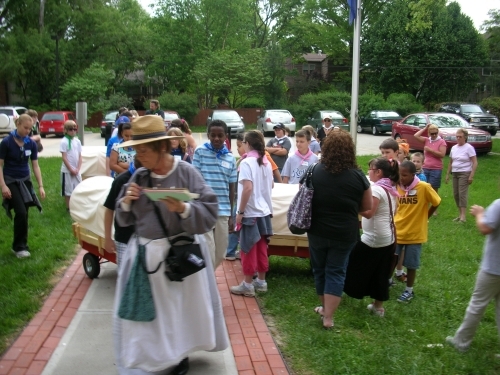 In addition to learning about the hardships and trials of the trail, students will participate in loading and pulling their "wagon" with supplies, playing a pioneer game, and autographing "Independence Rock." Students will be divided into six groups or "families." Throughout the tour they will read diary entries from these emigrants, which will give students an understanding of the hardships and benefits of the move west. Will the families make it safely to their new homes? Only their decision-making skills will allow them to arrive safely. 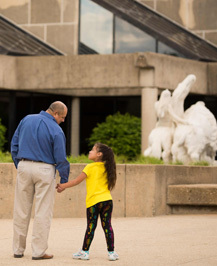 This tour addresses Kansas and Missouri grade specific standards. Teachers will receive pre- and post-visit materials to help prepare the students for the adventure. 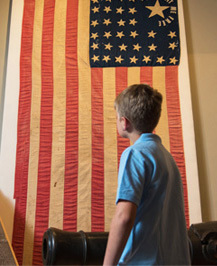 Included in the pre-visit materials is a lesson about six families who actually traveled the trail. Also included are two Read Kansas! lessons--I-6 "Trade and Travel on Overland Trails" and I-7 "Life on the Trails". These lessons not only compare the Santa Fe Trail and the Oregon Trail but also give the students an opportunity to read primary source materials about two children who traveled these trails. The post-visit assessment piece involves journal writing. SL 4.3: The student will identify the reasons and evidence a speaker provides to support particular points. W 4.3 (a-e): The student will write a narrative to develop real or imagined experiences or events using effective technique, descriptive details, and clear event sequences. SS 2 continuity and change in the history of Missouri, the United States and the world. SS 4 economic concepts (including productivity and the market system) and principles (including the laws of supply and demand). SS 5 the major elements of geographical study and analysis (such as location, place, movement, regions) and their relationships to changes in society and environment. SS 7 the use of tools of social science inquiry (such as surveys, statistics, maps, documents). Summarize the events in westward expansion, including people's motivation, their hardships, and Missouri as a jumping-off point to the West. Reading--Identify and explain relevant connections between (a) text to text (text ideas--information and relationships in various fiction and non-fiction works--compare and contrast). Writing--Compose text with a (a) clear controlling idea and (b) relevant details/examples. See what others have said about this standards-based tour. Length of tour: approximately two hours. Number of students in a group: For the best experience, we recommend no more than 30 students per tour. Registration and scheduling: Contact the site administrator at 913-262-0867; or email Shawnee Indian Mission. Tours must be scheduled at least two weeks in advance.